As a team of experienced real estate professionals in Singapore, we showed sincerity with business owners seeking good office space for rent in Singapore and we seek to understand and provide them with the perfect match to suit their business needs. The Singapore commercial office rental sector is an extremely demanding one but we stand out from the rest due to our vast and long-standing contacts with commercial office landlords in the best areas. We always have available a constantly updated and comprehensive listing of available office space in Singapore, so if you are looking for the very best in office space, we can help you. View our various choice office selections below and simply click on the office venue that you would like to view and submit your request for viewing. We'll get in touch with you - No obligation and No commission from tenants. Far East Square is an unique mixed development located in the heart of Singapore’s Central Business District. Opened in 1999, it is a heritage conservation project with a vibrant mix of restaurants, cafes, and pubs, as well as shops, pushcarts, kiosks and offices. 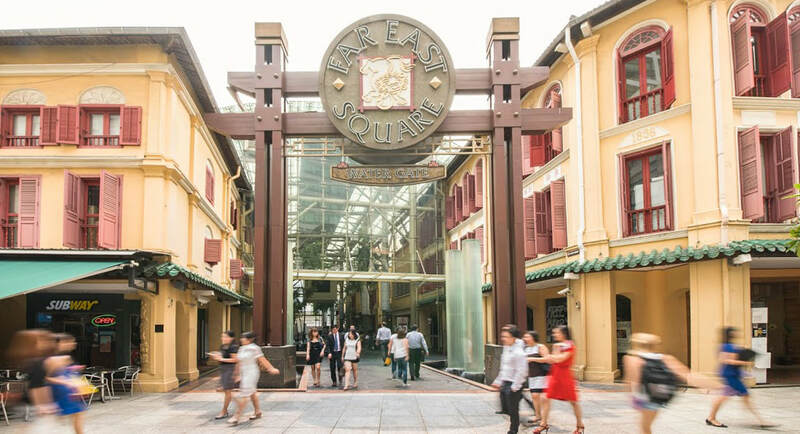 Just a short walk from the Raffles Place and Telok Ayer MRT stations, Far East Square is nestled at the confluence of Amoy Street, Pekin Street and Telok Ayer Street. Stroll into the complex, and discover a delightful palate of exquisite flavours of 30 food / dining outlets. Office units range from 592 sq ft located within modern shophouses with centralised air-conditioning system.